Have a question for The Sarojin? "The view from the lobby made me feel I'm in the beautiful village in the book..."
"The hotel and staff are lovely." 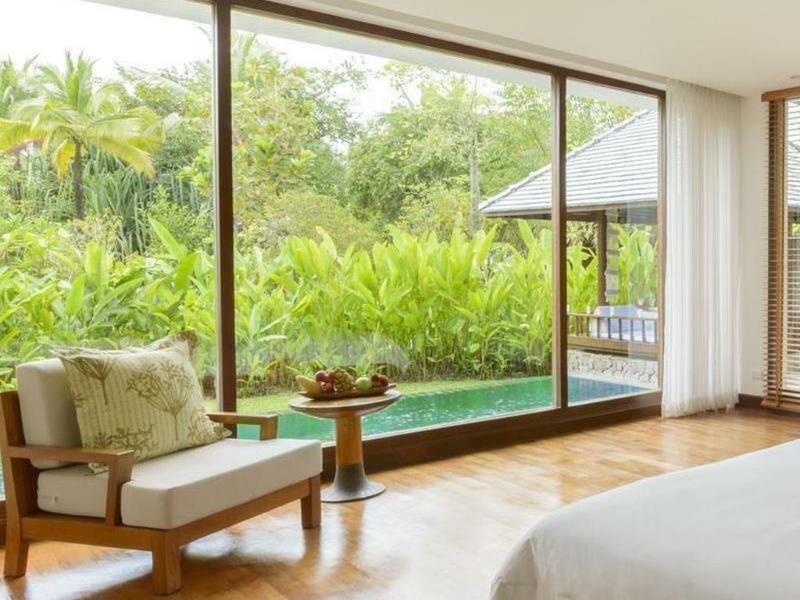 Enjoy a romantic getaway at Khao Lak’s The Sarojin, located on a secluded, 11 kilometer private beach where each guest residence provides total privacy, entered by crossing a stream and private garden. The landscaped gardens abound in wild fruit, herbs, and local trees. This 5-star resort is close to three 18-hole golf courses. Facilities include a swimming pool, spa, fitness center, several restaurants, croquet lawn, water sports, library, and a luxury boat exclusively for guest use. 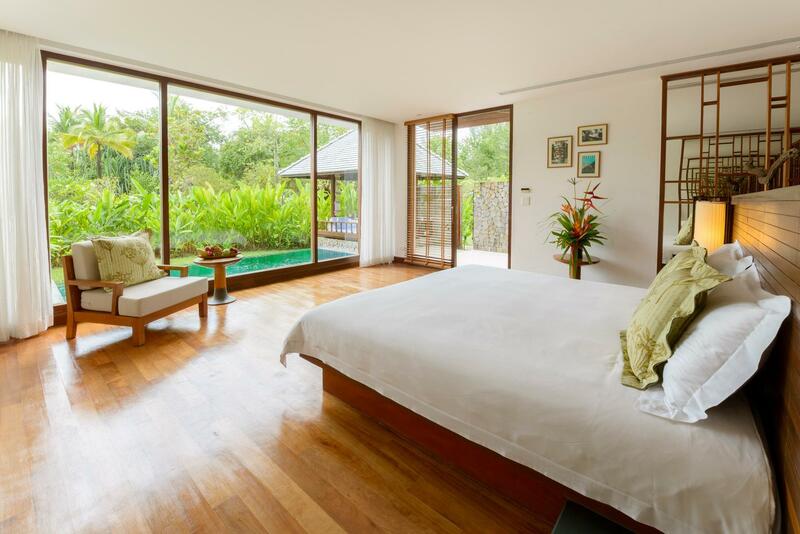 To make your reservation at The Sarojin, please proceed to our secure online booking form. "The site itself is incredible with fantastic gardens and bea..."
The room concept is nothing like I have ever seen, with the open bathroom. It's spacious, comfortable, and it stands alone, like a little cabin. The cleaning service comes to clean the room, and again in the evening to change the towels, bring additional water, etc. The staff pays great attention to detail. This place is very private, and it's quiet and serene; the perfect place to relax and be pampered. The pool is magnificent, always at the right temperature, and spotless. The breakfast: You can have it from 6 am until 6 pm! For someone who is not a morning person, it's perfect. In addition the food is delicious and plentiful. The only 2 things I didn't like were: 1. the mixed drinks were terrible. The strawberry daiquiri was very acid and sour; the pina colada came from a mix, and had no rum in it. 2. The seafood bbq was way overpriced, as were all the tours, taxis, etc. There are many greatThai restaurants on the beach and tours organizers. Use them instead! 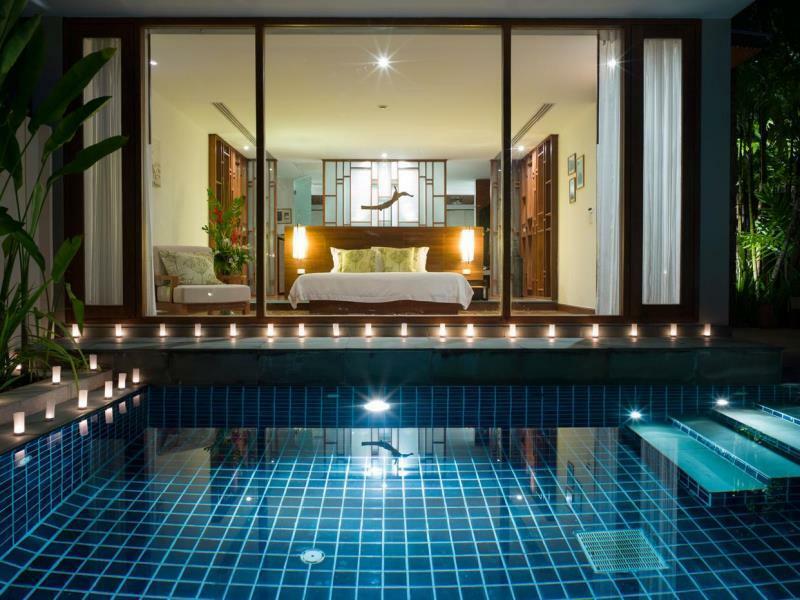 We stayed for 5 nights at the Sarojin, in the Spa Suite. 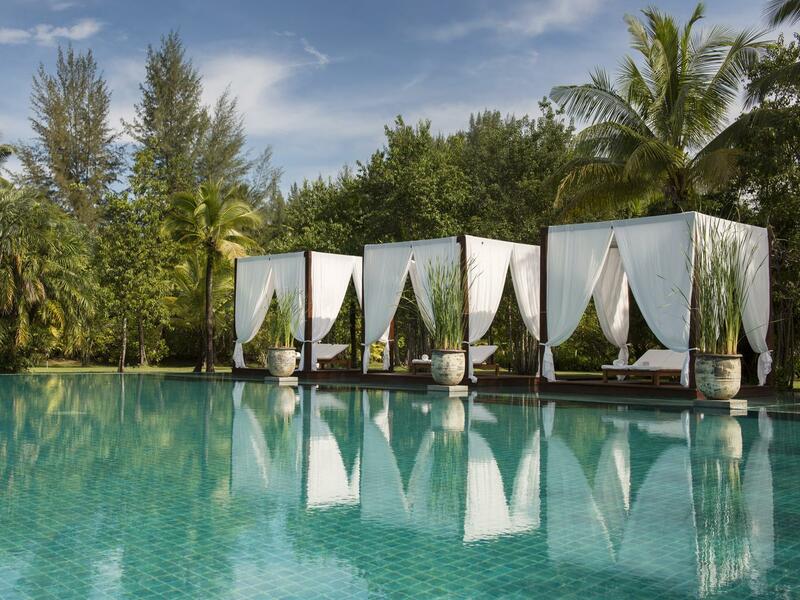 The Sarojin is not a chain hotel. It is family-owned and operated, and the attention to detail is meticulous. All of the staff are excellent and service was fantastic right from the time we were met by the hotel car at Phuket Airport. Khao Lak is less than 2 hours drive from the rowdiness of Patong Beach, but it is a world away. You can choose to stay at the hotel or take a taxi into town. Khao Lak is very laid-back and friendly, with small relaxed eateries and pubs. And a walk along the beach is truly pleasant, with no vendors. We will be back! The sarojin definitely lived up to its reputation as a service oriented romantic private beach resort. My partner and I enjoyed our time there very much and we look forward to visiting the sarojin again next year. We had a whole week here and found it a perfect place to switch off, relax and enjoy walks and swim along the beautiful white sandy beach. Not a spect of garbage and no one to disturb the peace of the place. The weather was ideal at the end of February. The staff very friendly and nothing was too much trouble for them. 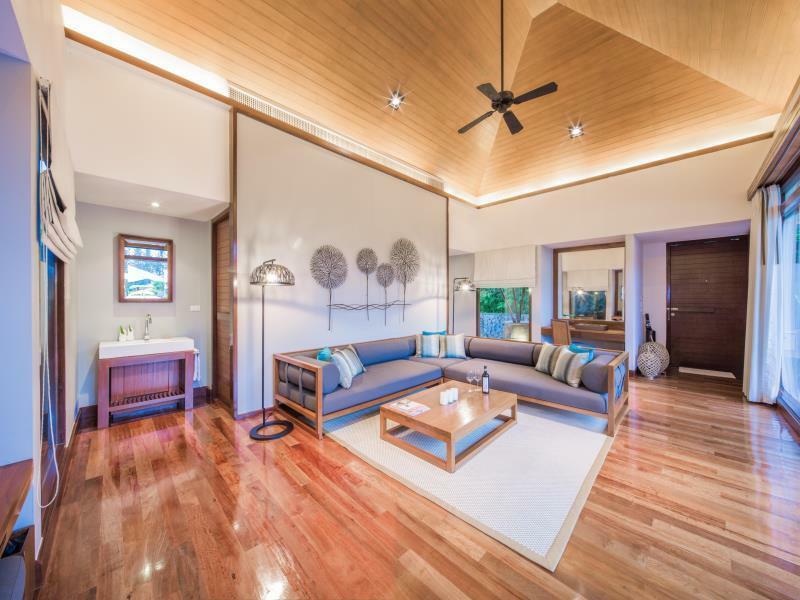 Very quiet surroundings with beach and forest, an hour drive from Phuket Airport. The breakfast is served from 6 am to 6 pm!! The staff performance is perfect with hospitality. We stayed at low season but enjoyed stay very much. perfect from the first to the last minute. Very friendly staff. Beautiful reception area, gardens, swimming pool, and beach side. Rooms are huge and nicely decorated. The whole day breakfast is great to avoid stress to have to wake up on time. Last day we left early so the kitchen prepared a massive breakfast basket for us. Great stay. Minor drawback; without promotional price, I think it may be a bit overpriced. Really very happy about this stay. Tried the breakfast at 6 pm (as they advertised on their website they were serving breakfast until 6pm. Not only is it true (only hotel I know of to offer this) but it is delicuous too! We had no time in the morning to get our breakfast as we left early for day trip to Similan Islands. Staff really knows how to deliver exceptional service. 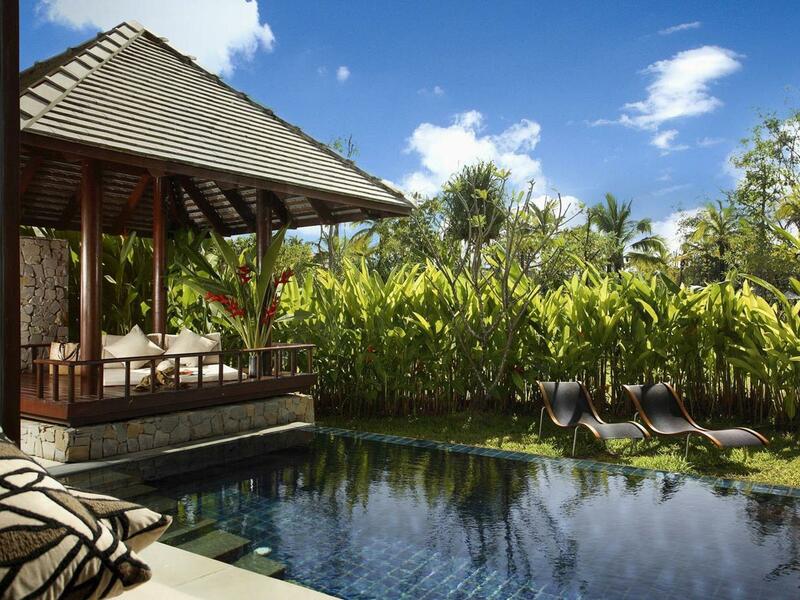 The Sarojin is a great spot to discover the Similian Islands from. But they are closed from May to November which we didn't know before we booked. The only boat trip they could offer us involved us having to drive 1hour 30mins back to Phuket marina, where we had driven from the day before, to take a boat from there, which ended up costing us a small fortune as there weren't any other guests that wanted to do this and they couldn't accommodate that this wasn't our fault. It would make more sense to stay in Phuket during this time and to explore the beautiful Phang Nga Bay from there, which isn't to be missed. The Edge, the beach restaurant & bar was a building site. The rooms on half of the hotel were all being renovated. The pathway to walk through was being re-laid so we were expected to walk through the grass which had become a bog after heavy rain. It all felt a bit half-hearted. I can't comment on peak season, but I wouldn't pay for this experience again which is a shame. Beautiful design and garden. Lush vegetation, wide variety of trees and flowers, very nice pool, very helpful staff. Excellent tours and activities. Minuses: bathrooms lack a bit of privacy from the bedrooms, Beach was a bit of a disappointment (sand is yellowish, could not swim due to jellyfish). Wonderful resort. Great staff. So peaceful. I will come back ! We had an amazing time at Sarojin for our wedding anniversary. Their service, staffs, atmosphere, location, no kids... totally great. It wasn't cheap but affordable. We'll be back again for our next cerebration, for sure! This hotel is as good as the reviews say. The breakfast is also outstanding- we tried almost everything on the menu! The only small downside is the garden residence rooms do not have proper dividing screens/doors so you can see through from the bedroom to the shower (the bathroom has a frosted door on one side but is not fully enclosed). The gym is also quite small, but was fine for me as I was the only person there each time I used it. If there were more than 3 people in there it would feel quite claustraphobic. The small garden area in front of the room is fairly private if you want to sunbathe. All in all it's pretty fantastic! The hotel and staff are lovely. 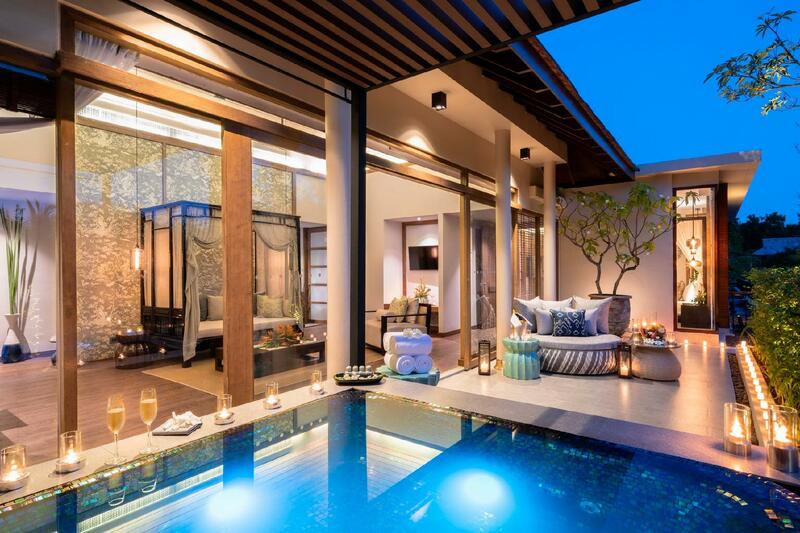 A truly luxurious retreat. The weather was bad (October) when we were there so we didnt get to enjoy the location i.e. beach or visit the similian islands. We spent some time by the pool in the very brief moments when the sun came out. As two female friends travelling we found it to be very orientated towards couples but we still had a nice time. We had the best stay we have ever had in Thailand at the Sarojin. My husband and I have been travelling to Thailand for 30 years and always like to stay somewhere different so we are able to fully embraceThailand and what it has to offer. Our room, pool, gardens, food and staff were all fantastic. I felt so relaxed and very spoilt and indulged staying here.I applaude the Kemp family for creating a really amazing oasis. The resort is gorgeous, the food is absolutely delicious, the rooms stunning but most importantly is the really, really wonderful staff from managers to the gardeners. I congratulate you! 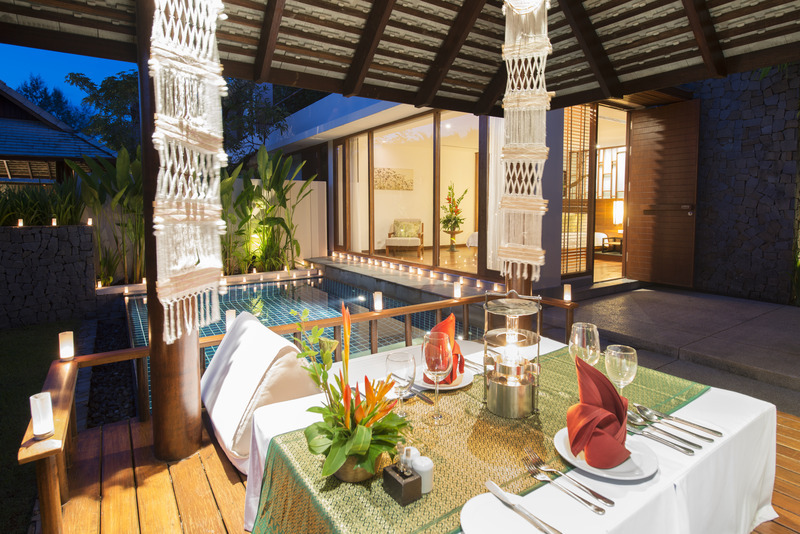 From the moment you arrive at The Sarojin, it ooses class and relaxation. The site itself is incredible with fantastic gardens and beautiful rooms. The staff ratio is about 3 to 1 and they couldn't do enough for you. Food is spot on and I would recommend this to anyone who wants to try and 'non-chain' hotel. 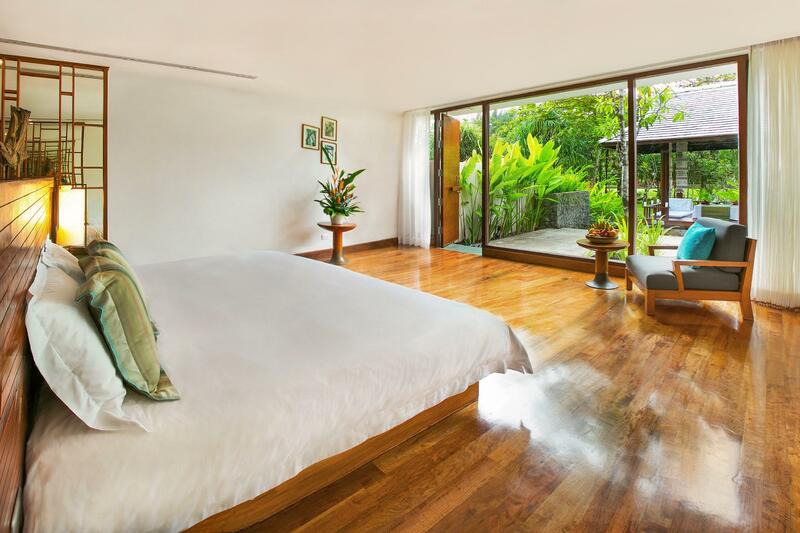 If you consider to taravell to Khao Lak and your budget is allowed, I highly recommend you to stay The Sarojin especially couple travelled as per the room design. The service was detail oriented. The view from the lobby made me feel I'm in the beautiful village in the book... The room was just perfect but no privacy... The beach was very clean! The taste of food was high standard for resort hotel even breakfast! This is a really private and clean hotel . We stayed at the suit and we were really enjoy it .The foods are excellent , no matter Thai food or western continental style .. The price is ok for me but I did read some reviews that said it's expensive ... However I stayed in Thailand for 10days and I had the best Thai food here at the Sarojin ! One suggestion here is if you book the suit , you will receive a complimentary massage for 60 min and please pre-book the time you would like it with the hotel before you go . The spa suite was really great! After seeing the pool one I was tempted, but if I were to choose again I would definitely do the spa, as it is on the second floor with a private terrace that has the spa. Everything was great, and none of the other hotels that we walked by could compare!